And this is everlasting life,that they may know You, the only true God, and Jesus Christ, whom You have sent. Jesus prays to his Father and his prayer is that we get to know his Father who is the ONLY TRUE GOD, but yet his very words, whom they say they love and call their Savior, are ignored and dismissed in order to cling to a trinitarian doctrine that neither he nor his disciples never taught. They don’t seem to care that their explanations of trying to define what is not taught in the holy Scriptures is mind-bending indeed, a circle that cannot be broken at any cost. They dismiss the very fact that many times we are taught in Scripture by Jesus and by his disciples that Jesus has a God, but yet still spread the lie that Jesus is God Almighty. It doesn’t care, in the trinitarian doctrine, the fact that many times Jesus is called “God’s son,” they still make him to be "God the Son." It doesn’t matter how many times the disciples also show the distinction between God the Father and Jesus his Son – the trinity doctrine must be defended at all cost for one’s life depends upon it! 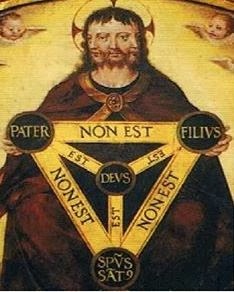 The trinitarian doctrine is not a ‘mystery,’ it’s a Lie. It has been well said that a man who is honestly mistaken and hears the truth, he either ceases to be mistaken or he ceases to be honest. This may well be the choice for our trinitarian brethren. Yes, God is an invisible Spirit, Jesus was the Word that became flesh, the one and only Son who came from the Father. As Jesus said, eternal life is to know God and Jesus Christ who God sent. 'But when He says “all things are put under Him,” it is evident that He who put all things under Him is excepted. Now when all things are made subject to Him, then the Son Himself will also be subject to Him who put all things under Him, that God may be all in all. '( 1 Corinthians ch. 15 vs. 27b and 28. 'Then the end will come, when he hands over the kingdom to God the Father after he has destroyed all dominion, authority and power.' (1Corinthians ch. 15 v. 24). Amen Sister! Praise our lovely Lord! That is a serious mistake! If the Lord Jesus is NOT the Father, then WHO is that 'FATHER'? Is it an 'unknowable God? There are only two fathers, the Lord our God Jesus Christ and the other is Satan, the god of this world. For us who believe in the Lord Jesus Christ is only ONE God and that is the Father (1Cor. 8:6 + Eph. 4:6). If the Father is NOT the Lord Jesus Christ, then the Lord Jesus is NOT the Lord God, and if both are God, then there are TWO Gods. No Thomas, absolutely no, this is a great error, intellectually and spiritually. Yes I believe that the trinity doctrine is a lie, it is an Antichrist doctrine denying that Jesus Christ is the Lord God the Almighty our Father who is in heaven. That satanic doctrine 'the trinity' was invented in Rome by the catholic church who called their first Pope (the man of sin the Antichrist), 'Holy Father'. They stripped the title Holy Father from the Lord Jesus and gave it to the first Pope Linus and then to every other Pope till this very day. The pope is called the Antichrist because he usurps the title Father which belongs to the Lord Jesus. Satan said, 'I will make myself like the Most High' (Isa. 14:14), that is like Jesus Christ. Because the Lord Jesus holds the last office of the high priest in the Old Testament, and that office required from the priest to pray for the people of God and to bring a sacrifice for the sins of Gods people, therefore Jesus prayed to God. But because there is no other God than Jesus, therefore Jesus prayed from the priestly office to God, that is Himself, and also offered up Himself as the last sacrifice for the sins of His people once and for all on the cross. Thomas, God did NOT send someone else, He came into this world by Himself, that's why He is called Emanuel, meaning God with us, and He was only CALLED the Son of God. Jesus is not the Son of another person or God, or entity. No no! He is God clothed in flesh, so that we can behold His Glory as the only begotten Son of God, full of grace and truth. (begotten, means, 'one of a kind'. Please read 1 John 5:20 again, it is Jesus who is the true God and eternal life. It is Jesus who is the the ONLY God and saviour (Jude 1:25). There are numerous Scriptures who tells you that Jesus Christ is our Father who is in heaven, but if you don't believe one Scripture, you will not believe the rest of the Scriptures. Paul, the difference between God and Jesus is as 1 Corinthians ch. 8 v.6 states:-'yet for us there is one God, the Father, of whom are all things, and we for Him; and one Lord Jesus Christ, through whom are all things, and through whom we live.' The difference is in the phrases 'OF whom and THROUGH whom'. God is the creator, Jesus is the mediator. This is everlasting life, that they may know You, the only true God, and Jesus Christ whom You have sent. Do you know the only true God? And what is His Name? Is He the creator of all things? Do you know Jesus Christ? Or do you only know about Jesus Christ? Is He not the creator of all things? Why did He accept worship? And why is He called the Alpha, meaning the first? Are there two Alphas (firsts)? What do you think? Please tell me. Brenda, if God is the only one who is good, then any one other is bad, including Jesus. I preach Jesus Christ to be the only true God who is good and any other god is bad, in fact a false god, the devil who proclaims himself to be that good 'God' called 'The Father'. Jesus said, 'if you do not know that I am He, you will die in your sins'. Therefore you need to make every effort to believe in the true God who alone is good , Jesus Christ our Lord and ONLY God (Jude 1:25). Brenda, Jesus said, that the way is narrow and only few are those who find it, therefore enter the narrow way Jesus Christ alone. I haven't come across you for some time only on The Benevolent Hecklers blog yesterday, where I agreed with some things you said and was going to leave a comment but ended up not doing so through lack of time. I came over to Thomas' blog today as a result of looking on my other blog 'Fatherithankyouforjesus' to see if I had put a poem on there that I am putting on a post on my 'lighthousevision' blog. Nothing is coincidence eh? Jesus is the good shepherd. The word 'know' in the Bible means 'to be intimate with'. As Jesus is the Word of God that became flesh and made His dwelling with us...as in:- 'And the Word was made flesh, and dwelt among us, (and we beheld his glory, the glory as of the only begotten of the Father,) full of grace and truth.' John 1 v. 14, then I think this is what would be the answer to our search. This does not make Jesus bad. God is Spirit and Jesus is His Word, and if I decide to speak something good then I would be considered good. Yet the origin of those words would be in who I am and what I want to do. 'Words' have to have an origin. The Word of God was known as 'Jesus' in the flesh, and the meaning of that name reflects His purpose on earth. That is when God made Him our Lord, and He became the one and only mediator between man and God. Regarding Jude 1.25, Jesus is the express image of God, the only way that I can communicate with God. He is the first of many brethren, and I too have become a child of God. I preach Jesus as the Son of God who was crucified for us, the only way back to the Father. Jesus is the Son of God who was crucified for us, the only way back to the Father!! Thank God for Jesus!! What a wonderful way to start the beginning of the week!! Yes, I have been away for a while on holiday in beautiful New Zealand, but I'm glad to be back again to see that you still are zealous for our wonderful Lord and God Jesus Christ. Yes Brenda, it was Jesus who said that 'only God is good', but do you believe that? If you believe that only GOD is good, and Jesus is NOT that GOD, but he is only His son, then Jesus would NOT be good, since God alone is good. If God alone is good and Jesus is NOT that God, that does make Jesus bad. You see Brenda, if you separate God from Jesus, you will always end up in error. You have quoted John 10:15 yes, Jesus has said that, but you should be able to say the same, therefore I ask you, which Father knows you and please tell me His Name? Just the same as Jesus, you should also know your Father who is in heaven and His Name. Jude 1 :25 KJV "To the only wise God our Saviour, be glory and majesty, dominion and power, both now and ever. Amen." Please tell me, who is the only wise God our Saviour?? Note, it says, the ONLY! And the Bible says that there is NO other. Brenda, it has to be the Lord Jesus, why can't you see that?? Thomas, you said, 'Jesus is the Son of God who was crucified for us, the only way back to the Father!! Thank God for Jesus!! '. What you have said is true. But that it is only a metaphorical statement. If you think that this unknowable 'God' had a Son and He sent him to be crucified for us, then you do not understand the Scriptures or the power of God. The reality of your metaphorical statement is, that God did not have a Son, but rather He IS the Son who came from heaven (the realm of the Spirit) and gave Himself for us to be crucified for our sins. Likewise, Jesus is not the way back to this unknowable person called 'God' or 'Father', but rather, when someone has come to Jesus, that person IS back with the Father, or God. Thomas, if Jesus is supposed to be the Lord God, then to which God do you give thanks for Jesus?? glad you enjoyed your holiday in New Zealand, we have been to Auckland and Rotorua, it was nice. I think that these verses are beautiful and explain how we can be separate in the flesh, but one with God in Spirit. '"I do not ask on behalf of these alone, but for those also who believe in Me through their word; that they may all be one; even as You, Father, are in Me and I in You, that they also may be in Us, so that the world may believe that You sent Me. "The glory which You have given Me I have given to them, that they may be one, just as We are one;…John ch. 17 vs. 20 - 22. Brenda, if you believe that only God is good, then you must believe that the Lord Jesus is 'GOD', the only God, or the Lord Jesus would not be good. So, you come to know the Father 'THROUGH' Jesus. If Jesus is NOT the Father and you claim to know Him, who then is the Father? I think that you can't tell me anything about the Father, because to you He is an unknowable God. Also, there is not such a thing as 'the original script'. If there would be one, I surely would know it. 'To the only God our Saviour THROUGH ….. '. Well, does the word 'THROUGH' change the meaning so that the Lord Jesus is NOT the ONLY GOD our Saviour? Or is their another one? If you go THROUGH Jesus to the Father, then please tell me, who is the Father? If you say that the Father's Name is 'Yahweh', then you believe in TWO gods, and have transgressed the first commandment of the Lord, Yahweh and Jesus equals two gods, just as the Father and Jesus equals two gods. Or the alternative is, that you don't believe that the Lord Jesus is the 'ONLY GOD' and then you will die in your sins. Look Brenda, there is no way around that great problem. The only way that this confusion and unbelief will stop, if you would believe in the Lord Jesus Christ. Yes, just as I do. Paul, there is no way you would get me to deny the existence of God, the Father. I have to come to the conclusion that we shall agree to differ. You will not acknowledge that God is Spirit, and I can not understand how you are not able to see that God and His Word are One and the same in the Spiritual sense, yet the Father is greater than all, even though Jesus said His Father is greater than He and He is seated at the Father's right , and calls us brothers saying that He was the first of many brethren. Siblings have to have a Father. I know that the things of God are foolishness to the carnal mind, but I fail to see how you can not understand the Scriptures clearly as you read. I think you must simply ask Jesus what the truth is. As long as you feel you are seeking Him and doing what He is calling you to do, then it is that Word that we are judged by. Oh yes Brenda, I always acknowledge that God is Spirit and those who worship Him must worship Him in spirit and in truth (John 4:24). But do not forget that the Lord Jesus is the Spirit (2Cor. 3:17), and therefore we ought to worship the Lord Jesus in spirit and in truth. If you worship any other than the Lord Jesus Christ, you have transgressed the second commandment of the Lord. No Brenda, I do not trust my feelings and neither should you, but we should trust in the Lord Jesus Christ with all our heart and lean not unto our own understanding. You can replace the word 'feel' with 'believe' Paul because that is what I mean when I use the word feel. God has made Jesus our Lord, who was the Word of God made flesh while He was on the Earth, and now the Holy Spirit is our teacher who brings the same message as the Lord Jesus did while on Earth. Jesus said to His disciples before He went to be with the Father:- 'If you love me, obey my commandments. And I will ask the Father, and he will give you another advocate, who will never leave you. He is the Holy Spirit, who leads into all truth.' Jesus had to leave, the Holy Spirit was the Father's replacement for Jesus to us, that is how we can become children of God born of the Spirit, just like Jesus was. Jesus and the Holy Spirit are both the same, the way the Father is able to speak to us. Brenda, how many people is your God? You are trying to rationalize metaphors, you are supposed to explain the metaphors and not rationalize them. The Holy Spirit is NOT a separate person, the 'Father's replacement for Jesus', and neither is He another person who is teaching us. The Holy Spirit is the Lord Jesus who is teaching us in the Spirit. Brenda, you have a trinitarian concept of God by dividing God into three entities, just see the image on Thomas post above. Mr Holt has a few good points, but he doesn't know who the Lord God the Almighty is. As I have said, that the trinity teaching is the greatest and most powerful deception Satan has ever produced and most Christians believe that lie and suffer the consequences thereof. You should not divide God into different persons, one as the Spirit, another as the Son, another as the Father, another as God and still another as the Word etc. but you should explain God in Jesus Christ, just as I do. Look Brenda, you need to deal with that trinity problem. Perhaps start with answering my questions. I do not make it complicated but simple and logical, so that even the natural mind can understand. How can I win an unregenerate person for Christ if he cannot understand what I say? Logical questions are suitable for both, the natural mind and the spiritual mind. If anyone claims to have a spiritual mind and transgresses the logical, he understands nothing. Therefore it is important to answer my questions truthfully, I have asked those questions not for my sake but for yours in order that you would believe in the truth. The truth is Jesus Christ our Lord (John 14:6) as I teach it and not as the trinitarians or the Jehovah Witnesses teach it. I'm sorry Brenda, I have posted this comment by mistake on the other post last night. You say Paul:- 'but you should explain God in Jesus Christ, just as I do'. That is what I am saying Paul, God - in Jesus Christ. As for where you say:- 'If anyone claims to have a spiritual mind and transgresses the logical, he understands nothing. Romans ch. 8 v.6 reads:- 'The mind governed by the flesh is death, but the mind governed by the Spirit is life and peace.' I believe absolutely what John ch. 14 says Paul:- 'Jesus told him, “I am the way, the truth, and the life. No one can come to the Father except through me.'. No one can come to the Father except through Jesus, because God, the Father, has made Jesus our Lord. '…"For it was not David who ascended into heaven, but he himself says: 'THE LORD SAID TO MY LORD, "SIT AT MY RIGHT HAND, UNTIL I MAKE YOUR ENEMIES A FOOTSTOOL FOR YOUR FEET."' "Therefore let all the house of Israel know for certain that God has made Him both Lord and Christ-- this Jesus whom you crucified' Acts ch. 2 vs. 34 - 36. No Brenda, you do not explain God in Jesus Christ. Tell me, which God the Father, has made Jesus our Lord ?? Who is that God the Father ?? And, which 'Lord said to my Lord, sit at my right hand........'?? Who is the other Lord ?? Tell me, to which FATHER did Jesus go ?? Who is that Father ?? And which FATHER did Jesus ask ?? Are both the same ? the same WHAT ?? Does the word 'BOTH' mean two or one ?? In how many gods do you believe Brenda ? Then, when I come over to Thomas' blog, I find that Thomas has more or less confirmed what I was thinking by referring to 'using scripture to show clearly who Jesus is' in his comment to me (Thank you Thomas). I have to wonder if there is some deep rooted reason why you can not accept what the scriptures clearly say and what Jesus Himself says regarding His Father. I have never come across someone who denies the existence of God the Father like this before, when Jesus so clearly acknowledges Him. I simply accept what the scriptures reveal to me as I grow in Him and if there is something that may not appear to line up to my carnal mind, I do not discount all other wisdom and knowledge that has been revealed through other scripture, but I wait upon the Lord to reveal more truth. When I became born again of God's Spirit Paul, I was not born fully mature, and neither is anyone else. There is a Spiritual maturing that has to take place as we have our minds renewed in Christ Jesus. I can only answer you according to scripture Paul. I truly believe, and have discovered, that the Bible is not a book but is a vocabulary and that we learn line upon line, precept upon precept. Just as I do not say 'yes' and 'no' at the same time, neither does God. If we seek Him in sincerity for the truth, I believe we shall find it. When we are born again of God's Holy Spirit we become part of the body of Christ, and with the mind of Christ we become all One in Christ Jesus, and One with God the Father. There is a time when God gives all authority to Jesus but also a time when Jesus delivers the kingdom back to God. Brenda, I find it amazing that you will not answer my questions. I did not ask you to quote the Bible to me, I'm old enough to read the Bible and I surely know what it says, and anyone can quote the Scriptures. You should consider my questions as if the Lord Jesus would ask you. And if you can believe it, it is the Lord Jesus who did ask you those questions and not I, I'm only an Ambassador of Jesus Christ our Lord. Brenda, I do NOT deny the Father as you have said, to the contrary, I preach the Father. For to us is but ONE God and that is the Father! Beside the Father is NO other God! Our difference is that I preach Jesus Christ to be our Father who is in heaven and you deny that Jesus Christ is our Father who is in heaven. Look Brenda, again, if the Lord Jesus Christ is NOT your heavenly Father, then please tell me who is ? And also His Name ? If you cannot and will not, then your god is an unknowable god, and your preaching is in vain. I have told you many times Paul who the Father is, so I do not know why you say that I will not answer your questions, it is quite evident to whoever has read my comments. It appears that you will not acknowledge my answers. My Father is the same Father that Jesus calls His Father, the One He speaks about constantly, the One who's right hand Jesus is seated at, the One who gave Him all authority, the One who Jesus will hand the kingdom back to. I have told you that He has many names, YHWH (pronounced Yahweh), 'And God said to Moses, “I AM WHO I AM.” (Exodus ch. 3 v. 14). .
Jesus is speaking those words about the Father quite plainly. Brenda, it's not true, it is a lie. I have been explaining that many times. The Lord Jesus said, 'that MOSES wrote about ME! (John 5:46) and not about any other god, but you don't believe Him. By that I mean, that you don't believe that the Lord Jesus Christ is the creator of heaven and earth, the only true God, and beside Him is NO other. Paul, It sounds like you have learned deception from man's tradition instead of from God. I am going to tell you about the very first time I started to realize the "church" teaches deception.... It was very early in my walk with God and his Son, Jesus. There were several of us grouped in a small room in the largest building in town, that building was also known as a church. We were discussing the baptism of Christ Jesus. This particular church taught what you believe, that Jesus is God. Immediately after the teaching, I asked the most simple question, If Jesus is God, who spoke from heaven claiming Jesus was his Son??? That one simple question, coming from a child like understanding, showed me that warnings in the scriptures were absolutely true, there will be deceivers who claim to know God, and we must watch out for them, and warn others as well. Moses writing about Jesus does not make Jesus the Father Paul. We can not discount what Jesus says about the Father and all the scriptures that say Jesus is God's Son who will hand the kingdom back to the Father. Jesus was a man born of God's Spirit, the firstborn of creation, the first of many brethren. 1 Corinthians ch. 15 vs. 20 - 23 say :- 'But now Christ is risen from the dead, and has become the first fruits of those who have fallen asleep. For since by man came death, by Man also came the resurrection of the dead. For as in Adam all die, even so in Christ all shall be made alive. But each one in his own order: Christ the first fruits, afterward those who are Christ’s at His coming. I love the way scripture links with scripture, and I love the way that God has enabled us to be reconciled back to Him through Jesus. Thomas I agree absolutely with you. My persecution has come from the 'church' because I question many things taught within the 'denominations'. Well Thomas, everybody can say that. Please tell me with which God did you walk? Did you walked with TWO persons? I know Jesus, but who is that other? You see my friend, 'heaven' is the realm of the spirit, and it is God in Jesus Christ the Holy Spirit or plainly it is the Spirit of Jesus Christ who spoke from the realm of the spirit (which is heaven) and He testifies about Himself till this very day that you and Brenda and I should believe in the Lord Jesus Christ. If you claim to know God, then please tell me Who is God and what is His Name ? My Bible says Jesus is our ONLY GOD our saviour (Jude 1:25). Jesus is called the Mighty God (Isa. 9:6) and many more passages. Yes Brenda, Moses writing about Jesus does make Jesus the Father, there is but ONE God and that is the Father (1Cor. 8:6). Jesus said, 'that I and the Father are ONE!' (John 10:30). But you and Thomas say contrary to the Scriptures that Jesus and the Father are TWO. Isaiah and all the prophets of God testified about Jesus Christ (Acts 10:43) to be only true God! Isaiah said, that Jesus shall be called everlasting Father (Isa. 9:6). And anyone who speaks by the Holy Spirit will testify about Jesus Christ (John 15:26). And neither do you and Thomas believe that God created the heaven and the earth (Ge. 1:1). The Scriptures say that it is Jesus Christ who created all things and nothing came into being apart from Jesus Christ (Col. 1:16 and John 1:3-10). Yes, Jesus is all those things quoted to us in Isaiah ch. 9, because He is the express image of God to us, the Word of God made flesh, and the One and only mediator between man and God. If Jesus was the first born of all creation, the first of many brethren, then what do you think 'creation ' means here Paul and who are the 'brethren' that follow. You know what I believe regarding this, and what I have written about what I believe. I do speak by the Holy Spirit Paul, and do testify about Jesus Christ. No Brenda, the Son has NOT revealed the Father to you. Otherwise you would believe the Scriptures and what Jesus has said, John 10:30 I and the Father are ONE! You say contrary to Scriptures, that Jesus and the Father are TWO. John 14:9 Jesus said, he who has seen ME has seen the FATHER! You say that Jesus only represents the Father. Isa.9:6 says that Jesus is the Father and there are many more. And neither do you speak by the Holy Spirit. For the Holy Spirit will testify about JESUS (John 15:26) just as I do. But you are demoting the Lord Jesus Christ to second place after a so called God whom you call Father. To you the Lord Jesus is only a Son of this unknowable God called Father of whom you know nothing about and not even His Name. And in Revelation 21:5 is the Lord Jesus who is sitting on the throne and no one else. Please read the Scriptures carefully, 'Behold I am making all things new'. Who do you think is speaking?? It's not complicated Brenda, Jesus is speaking, because it is Jesus who created everything in the first place, and He said that He is going to make all things NEW! Remember, the book of Revelation is the revelation of Jesus Christ, or Jesus Christ revealed. It seems to me that the Lord Jesus has NOT made Himself known to you, otherwise you would preach the Lord Jesus Christ to be the only God of the Bible. Look Brenda, I and all the Apostles worship the Lord Jesus Christ, and Jesus never ever refused worship. The Lord said, that you shall ONLY worship the Lord your God, so then, why don't you worship only Jesus Christ ?? But as it is you worship an unknown god called Father, and for this reason you don't understand the Scripture passaged you have quoted. You need to start with step one, to believe in Jesus. Yes, only in Jesus Christ and in no one else, and then you need to ask the Lord Jesus to open your eyes so that you can see the Lord Jesus in every passage of the entire Scriptures. Well, it's not difficult, Jesus said, that the way is narrow and only few are those who find it. And the Lord Jesus is the only door whereby you must enter. Brenda, I don't lie to you. There is NO other person next of the Lord Jesus Christ who is called 'God' or 'Father' or 'Yahweh' or 'Jehovah' or whatever else. And you need to turn back to the Lord Jesus Christ again and forsake all other gods, and that is not complicated either, just boot them out of your life and let the Lord Jesus reign. Any other god is a hindrance in your life and a stumbling block. Many well meaning Christians start with the Lord Jesus Christ and after fall away and believe in an unknowable god who cannot save or do anything. Paul, where you say you do not lie, it is the Bible that is truth. I will not add or take away from what is there no matter who tries to tempt me to. I love my life in the Lord. I can see quite clearly that the doctrine you have been taught has wiped away much of what Jesus and the scriptures say, and that you do not understand the deep things concerning creation. Creation began with Jesus. Of course, I believe just like you Brenda, 'that the Bible is truth', after all it is God's Word, or, perhaps I should say that it is the Word of the Lord Jesus, :-) but believe, according to who's interpretation ? You see Brenda, what is plainly written needs to be interpreted so that it makes sense, so that we have a benefit and can heed and adjust to it's instructions. The Bible is for our good and for our blessings, for the natural and the spiritual man alike, it is written so that we might escape the troubles and sufferings in this natural life and enjoy the good things of the Lord. As I have said many times before, there is nothing more important than to believe in the only TRUE God and in NO other. The reason for that is, that He is a jealous God and does not tolerate that we believe in ANOTHER one. We should not believe that the Lord Jesus is 'ONE' God and Yahweh is another God. That is because there is only one God! And if we believe in both, then we believe in two gods and have transgressed the first commandment of the Lord. So let's look at this other god whom you call 'Yahweh'. Everybody knows that the name 'Yahweh' is rendered out of the four letters 'YHWH' in (Exo. 3:14.) but many dispute that idea and say that it is 'Jehovah'. By any stretch of imagination, it is impossible to say or pronounce those four letters. Conclusion, they just try to cook up a name for God because they don't want it to be JESUS. Because it is debatable therefore you cannot be sure of his name, or basically you don't know his name. Now tell me, what did 'Yahweh' do? And what can he do? Did he created anything?? Brenda, you tell me, after all it is you who believes in that god? My Bible says that it is the Lord Jesus Christ who created all things and nothing came into being apart from Jesus Christ (John 1:3 and Col. 1:16). It seems to me that your god 'Yahweh' can't do anything. Do you think that your god 'Yahweh' raised the Lord Jesus from the dead?? Interesting, my God the Lord Jesus Christ said that, after three days He will raise Himself from the dead (John 2:19). Which God are you going to believe Brenda? Either Jesus is lying, or He is the truth, He can't be both. If the Lord Jesus is the truth, as He has said (John 14:6), then that other god 'Yahweh' is a liar and a deceiver and a false god. The question remains, in which God are you going to believe, Jesus or that false god 'Yahweh'?? Brenda, you can't serve two masters, it has to be one or the other, Jesus who is called the Christ or the other whom you call Yahweh. I will answer your comment tomorrow Paul. The Lord Jesus has told my friend and myself to 'feed the four thousand' today. We have to go into the streets to evangelize. That is how He speaks to us Paul, very clearly through the scriptures. And remember, the Lord Jesus is the bread of life. As far as going out into the street is concerned we have been doing it for over twenty five years, putting together poems and scripture into leaflets. The Lord told us right from the beginning to 'go into the highways and the byways', and often guides us through scripture and signs when and where to go. We always have a wonderful response, from both Christians and non believers, and have never had any rudeness from any person.. Very plain, God the Father, the One who formed the first Adam from the dust has made Jesus, His Son, the second Adam, who was born of God's Spirit, our Lord until the time of the end when all enemies have been put beneath His feet. Then the kingdom is handed back to the One who subjected everything to Him. Hallelujah..
Brenda, 25 years of street witnessing, don't you think that it is time for you to listen to what the Lord my God has to say to you? Please don't say that you are listening. No you don't listen! You are ignoring everything the Lord is saying to you. If you don't listen to me, you certainly will not listen to the Lord our only God Jesus Christ (1 Tim. 1:17). Because you don't believe the PLAIN written Word of God, therefore it is impossible for you believe and understand that which is NOT plain. Brenda, what do you think that a non believer or even a believer would think of a statement like that?? Such sayings and statements are the reason why the Christian Church has fallen away from believing in the Lord Jesus Christ. The mainstream Christian Church has become irrelevant and impotent. Yes, they have a form of godliness, but with their hearts they are faaaaar from the Lord Jesus Christ who is the ONLY God (Jude 1:25). Brenda, it's possible that you don't really think and discern what you are saying, but surely all your listeners will. 'God the Father, who formed the first Adam from the dust'. Who is that God the Father who created?? I know that you think, preach and teach that it is this unknowable god called 'Yahweh', created Adam from the dust. That is just not true Brenda, even though the Scriptures say that it is Jesus Christ who created everything including Adam, and He prepared for Himself a body, born of a virgin (Mary) (John 1:3+10 and Col. 1:16), but you are teaching contrary to the Scriptures. Please don't avoid my question. If it is the Lord Jesus who created everything, then any OTHER is an impostor! In this case 'Yahweh' is that impostor. Like all unbelievers, you only acknowledge the Lord Jesus as a son of God, just like Adam who is a son of God (Luke 3:38) and all of us who are sons of God. To be a son of God is no offence to the unbelievers, but for a man (Jesus Christ) to claim and prove that He is the Lord God the Almighty the Alpha and the Omega, the first and the last; that is an offence to every religious person. And because you have never acknowledged the Lord Jesus to be 'God', therefore you believe in a false god, and you need to deal with that and turn back to the Lord with all your heart. Both a believer and a non believer can find this information in the scriptures Paul. As for who God the Father and Jesus are, the whole of Colossians ch. 1, among many other scriptures give a beautiful explanation. Anyone can read it from the Bible and it takes no interpreting, it is quite plain to believer and unbeliever. It is only when we come to Jesus, the One mediator between man and God, that we can have eternal life, for eternal life is to know God and Jesus. Things were created through Jesus because He was the Word of God made flesh, in the form of a man born of God's Spirit in a virgin's womb who was to be called Jesus, the first born from the dead. I find it strange that in Luke ch. 3 v. 23 it states that Jesus (as was supposed) being the son of Joseph, because Joseph played no part in Jesus' conception. So there are some things that I do not understand, but I know that there have been things that do not appear to go together but which the Holy Spirit enlightens. There are some things which I know the Lord is showing me through the scriptures being spiritually discerned that I could never share with you because things can only be revealed to us line upon line and precept upon precept, and we are all having our minds renewed in Christ if we are born again and acting on the word of God spoken to us. Faith comes by hearing and hearing by the Word of God. Well Brenda, you are still ignoring my question. You seem to me that you are a master of escaping and avoiding my question. Look, all Christianity depends upon the question I have asked you, and anything after that are bonuses. Brenda, you should NOT believe in TWO gods, and neither should you believe in a FALSE god. If you preach a false and unknowable god, then your street preaching and witnessing is useless and in vain. Not only that, but then you are called a FALSE WITNESS, bearing testimony to someone else who is NOT the Lord God the Almighty, the creator of heaven and earth. Most important is to clear up that problem! Make a decision, either believe in the Lord Jesus, and yes, just as I do, or believe in that false unknowable god whom you call 'Yahweh'. Other people call him Jehovah, God, Allah or whatever else. It doesn't make any difference whether you call your god Yahweh or Jehovah, they are all false gods. If there is only one true god, then obviously, any other is a false god. Brenda, you can trust and rely on the Word of God (the Scriptures) who states that the Lord Jesus Christ is the ONLY, ONE, TRUE, and LIVING God of ALL creation, and equally important is to believe that before the Lord Jesus 'was NO God formed, and there will be NONE after the Lord Jesus Christ' (Isaiah 43:10). He alone is GOD and does NOT share deity with another. Please Brenda, read Isaiah 43:10 and add 11 and 12 to it and think about it, and then BELIEVE it! By 'believe it', I mean not only acknowledge it, but that you need to rid yourself of any other god so that only Jesus Christ remains. Only then you will be able to understand all those Scriptures you have quoted. Previously I have answered and explained to you all those Scripture passages and questions plus more, but it seems to me that you don't listen. I'll say it again, first, you need to believe in the Lord Jesus, and only then it is possible for you to understand those Scripture passages you have quoted. I will help you along that rocky road so that you will see the majesty of our Lord and God Jesus Christ in all those Scriptures. I think this will have to be the last comment to you on Thomas' post. I can see that you are completely deaf when you are answered with scripture, and you never respond by making any comment regarding these scriptures, all you have said regarding one or two is that they are 'metaphors'. How can scripture be classed as a metaphor when Jesus Himself said He was speaking plainly You just keep saying the same thing all the time. What comes into my mind at this moment is what my earthly father used to say when my siblings and myself used to argue and we used to say 'Dad, dad who is right?' My father used to always say 'Let's see what the Lord says. ', and always found an answer to our question, no matter what the issue. We all have to work our our own salvation and the Word itself is our judge. I feel that all has been said regarding Jesus and who He says the Father is. God the Father has made Jesus Lord, and given Him all authority until the time when He hands the kingdom over to God the Father. Giving someone all authority actually makes them like the person who has given that authority to them regarding power, but it does not make them that person. God's name was in the angel. In the Hebrew the name of the person was usually what the character of the person was. This is confirmed in verse 22 where God says:- 'But if thou shalt indeed OBEY HIS VOICE AND DO ALL THAT I SPEAK; then I will be an enemy unto thine enemies, and an adversary unto thine adversaries.' God is saying here that obeying the angel's voice is doing all that God speaks. God was speaking through the angel, the same as He does through Jesus. There is no more I will say to you on Thomas' blog regarding what is in this post Paul, but I may come over to visit your blog according to what you post. Many thanks Thomas for being so patient with us and allowing this discussion to go on as long as it has. Any time Brenda, and thank you for showing patience with Paul, I hope that He will someday learn to reject man's teaching and accept the clear Word of God.